Hi, I have always lived in Eltham, SE London and clearly remember in 1959/60 travelling on a Tilling Stevens coach then operated by Cliffs Coaches of Eltham. I remember being so impressed with the unusual ‘whistling’ noise on the overrun that I was determined to find out what make it was. I was 10 or 11 at the time and already a London bus and trolleybus fanatic. The coach was full-fronted, but had a full width bulkhead and I later surmised it had been ‘modernised’ with the full front. It had a Tilling Stevens badge however. I never recorded the reg. number I’m afraid, but is there anyone else who remembers this vehicle ? NXL 15 TSM L4MA8 (9838) bodied by Duple (Vega style) FC37F new to Cliff’s in 1953 and sold to Callaghan, London N1 by September 1962. I went to school in Sidcup from 1958 to 1964 and remember being mightily impressed by a ride to and from the London Motor Cycle show on one of Cliff’s first two Thames Trader/Duple Yeoman C41F reg. 559 and 560 RPC. This 1948 coach was acquired with the Kemp’s business in 1955. It is a Tilling-Stevens K6LA7 with Vincent of Reading C33F Coachwork. It was withdrawn in 1963. I was interested in the comment about Cliff’s of Eltham having a full-front Tilling-Stevens L6MA7 with Meadows engine. I recall a trip from Sevenoaks to Margate by Davis of Sevenoaks in 1955 or 1956. The refreshment stop on the way home was at Molash. I recall seeing a passing full-front coach sounding quite unlike anything I had heard before and saw the Tilling-Stevens badge as it went by. Could that have been the one from Cliff’s (presumably the Gurney-Nutting one as I think I would have noticed the Duple variety)? This might qualify as nitpicking, but technically the bodywork on Tilling Stevens Express Mk 2s (the model with chassis codes beginning with "L") should be described as "C37F" etc rather than "FC37F". 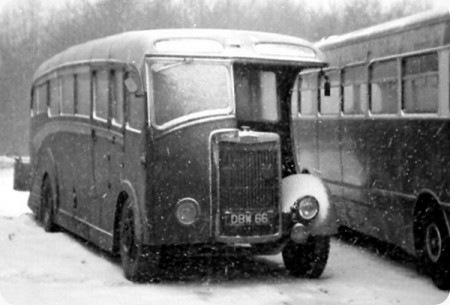 The model was designed from the outset as a fully fronted vehicle in the same way as the Bedford SB, Commer Avenger, Guy Otter, or Seddon Mk 4/6. Does anybody know how many Express Mk 2s were built? They were pretty rare. Further to Neville’s comments, I have a picture of a L4MA8 (4DC engine) which was owned by Trumans of Shirebrook. The body was C37F and it was virtually same as the Bedford SB style except for a different grille and higher build. It too was described incorrectly by the PSV Circle as FC37F. It was registered UNO 880 and was new to Edwards of Rainham. It was operated briefly by East Midland when they took over Trumans. I’m extremely grateful to Chris Ellis and the other correspondents for the info. on the Cliff’s Tilling Stevens coaches. I can safely say that ‘my’ ride would have been on the earlier Gurney Nutting bodied coach as I was quite familiar with the more common Duple bodied coaches. Was the whistling on over-run typical ? The trip described was a school trip to the wonderful Geffrye Museum in Shoreditch, and I indulged myself spotting trolleybuses passing on the 543/643, 647 and 649 services. There seemed to be at least one per minute in each direction – heaven !